230 pages | 40 B/W Illus. Beyond the apparently banal frame of "shopping streets" lies a dense network of expansive and parochial practices of exchange. Global Cities, Local Streets offers a compelling comparison across six cities, advancing new insights into the substance and methods of transnational research. This book is fine-grained contribution to the field of global urbanisation, and will be an invaluable teaching resource. 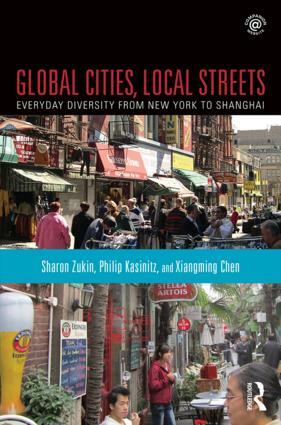 Sharon Zukin is professor of sociology at Brooklyn College and the Graduate Center of the City University of New York, and was a visiting professor in the Center for Urban Studies at the University of Amsterdam in 2010-11. She has written three books about New York City: Loft Living, The Cultures of Cities, and Naked City: The Death and Life of Authentic Urban Places, as well as Point of Purchase: How Shopping Changed American Culture. She won the C. Wright Mills Award from the Society for the Study of Social Problems for her book Landscapes of Power: From Detroit to Disney World. Philip Kasinitz is presidential professor of sociology at the Graduate Center of the City University of New York. His books include Caribbean New York: Black Immigrants and the Politics of Race, Metropolis: Center and Symbol of Our Time, Becoming New Yorkers: Ethnographies of The New Second Generations, and The Urban Ethnography Reader. He is co-author of Inheriting the City: The Children of Immigrants Come of Age, which received the 2010 Distinguished Publication Award from the American Sociological Association. Xiangming Chen is the dean and director of the Center for Urban and Global Studies and Paul E. Raether distinguished professor of global urban studies and sociology at Trinity College in Hartford, Connecticut. He is also a distinguished guest professor in the School of Social Development and Public Policy at Fudan University in Shanghai. His (co-)authored and co-edited books include As Borders Bend: Transnational Spaces on the Pacific Rim, Shanghai Rising: State Power and Local Transformations in a Global Megacity, and Rethinking Global Urbanism: Comparative Insights from Secondary Cities.